Are you visiting the island with the kids? Do you have family visiting from up north? 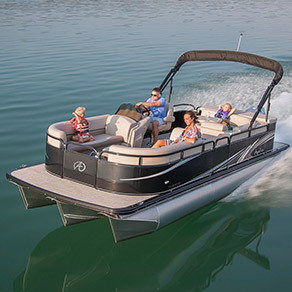 Our pontoon boats fit up to 12 people, making them a comfortable choice for hosting a fun-filled family excursion. The boats’ low platforms make them accessible even for young children or individuals with some mobility issues. Nature lover? Our pontoon boats give you a front row seat to the local sea and plant life. Watch dolphins at play, see manatees and tropical fish floating beneath the surface, and greet the sea birds as they wade in the shallows or perch in the mangroves. Renting a boat is your opportunity to observe Florida sea creatures in their natural habitat. It’s no secret that Southwest Florida is renowned for its fishing. Lined with sheltering reeds and mangrove roots, the Gulf Intracoastal Waterway provides the perfect habitat for all types of fish. 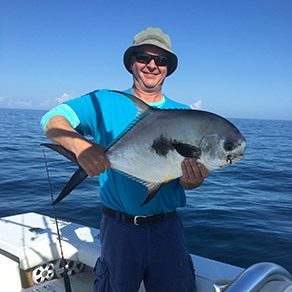 Anglers aboard our center console fishing boats can expect to reel in Sea Trout, Redfish, Jack Crevalle, Cobia and more. The true beauty of Palm Island (also known as Don Pedro Island) is best experienced from the water. Whether you enjoy fishing or nature watching, or just need a relaxing retreat, boating allows you to full access to the hidden natural treasures of the surrounding waterways. You can even take a day trip by boat to other nearby remote islands like Cayo Costa and Cabbage Key. Our rental boats are conveniently located at Cape Haze Marina, allowing Abe’s Boat Rentals to cater to Palm Island residents and vacationers. Let your on the water adventure begin! Rent a pontoon boat or center console fishing boat today. We have affordable daily, weekly and monthly rates. We offer free delivery straight to your dock when you rent a boat from us for three days or longer. Otherwise, our boats are docked at Cape Haze Marina, just two minutes by car from the Palm Island ferry, for convenient pick up. At Abe’s, we’re dedicated to providing a fun, care-free boating experience for our customers. That’s why we adhere to a strict standard of excellence when it comes to maintaining our fleet. We’re proud to say that we have the most meticulously maintained rental fleet in the Englewood area, checked daily for proper operation, safety and condition. Read more about us. Have questions about renting a boat? Visit our Boat Rental FAQ’s or call us at 941-662-9639.